California resident Gerilynn Aflleje was horrified when her 4-year-old Siberian Husky mix was killed by a local animal shelter over $180 in fees that she couldn't afford. Her dog, Chunk, had been dropped off at the Stockton shelter after getting lost in 2013, she later explained at a city council meeting. When Aflleje discovered her dog there less than a week later, she said the shelter demanded $180 within 24 hours for storing Chunk. Unemployed, Aflleje couldn't get the money in time. "We didn't only lose our pet. We lost a family member," she said. In a number of cities across the country, animal control agencies are aggressively going after pet owners with big fines for small violations. 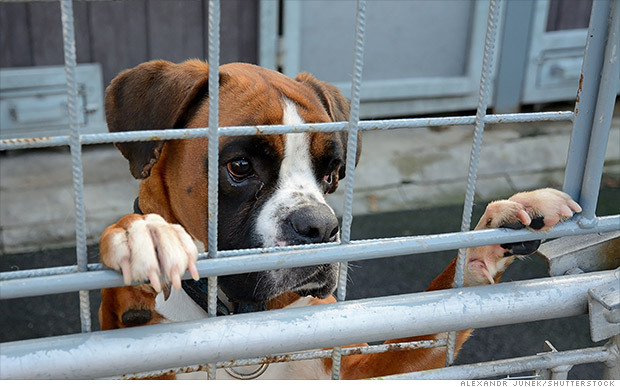 Some hold people's pets until they settle their bills, even if it means they end up killed. Others leave the dogs alone but issue arrest warrants for owners who can't pay up. We didn't only lose our pet. We lost a family member." The infractions can include failing to license a pet, owning a dog that barks a lot, or accidentally letting an animal get loose in the neighborhood. 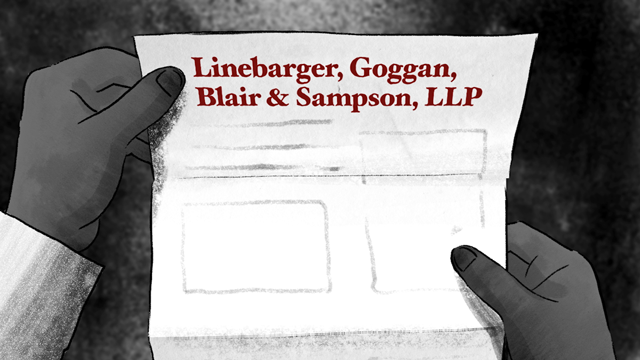 But the penalties are serious, often amounting to hundreds or even thousands of dollars. So are the consequences. When owners of seized or lost dogs can't afford to get their pets back, they relinquish their rights to the animal, which can result in a pet being euthanized. 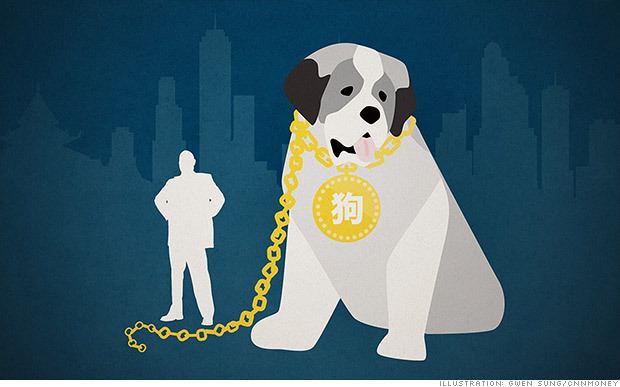 Meanwhile, a CNNMoney analysis of active warrants from a sampling of 15 cities and counties across the country found thousands of outstanding warrants for small pet-related offenses. Outraged pet owners and animal rights attorneys say these harsh tactics are all about generating money and unfairly impact low-income Americans. Chunk had been part of the Aflleje family since he was six weeks old. He was euthanized in 2013. But animal control agencies, which are run by local governments or contractors, say the fees and fines they collect help them to do their jobs and pay for things like storing animals. They also say their rules are meant to encourage responsible pet ownership and keep neighborhoods and animals safe. The ASPCA, an animal welfare non-profit, said enforcement efforts are "typically rooted in good intentions" but they can have "unintended consequences" that can lead to owners losing their pets. After coming under fire for alleged mistreatment of animals, Stockton has overhauled its shelter policies by lowering fees, facilitating more animal adoptions, and trying harder to reunite lost and seized pets with their owners -- all of which the shelter claims has resulted in a steep drop in euthanizations, from more than 75% of animals at the shelter in 2012 to 25% last year. It still faces a lawsuit filed by an animal rights group that alleges animal abuse, though the shelter says many of the allegations were already being addressed. But aggressive tactics are still common elsewhere. They are threatening people. They are intimidating people." Indio, California resident Elizabeth Vasquez says that animal control officers seized her two dogs, Silver and Canelo, for being loose in the neighborhood and fined her $500. She claims they were secure in her backyard at the time. She used her grocery money to pay $200 -- enough to get Canelo back. But animal control killed Silver before she could scrape together enough cash to get the dog out, says Vasquez, who speaks only Spanish. Allan Drusys, chief veterinarian for Riverside County -- which took over Indio's animal services in 2013 -- said Vasquez's dogs were loose and picked up as part of a routine sweep for stray dogs and that a payment plan should have been made available to her. One pet owner was hit with this hefty fine for failing to sterilize, vaccinate, microchip and license three dogs. In some cases, dogs don't even have to leave the yard for animal control to come calling. Last year, Riverside County inspectors incited controversy for going door-to-door and giving out citations of up to $400 per dog in Indio's low-income and mainly Hispanic neighborhoods. In some cases, they cited people for failing to have their pets licensed, sterilized, vaccinated and microchipped without even seeing the animals. 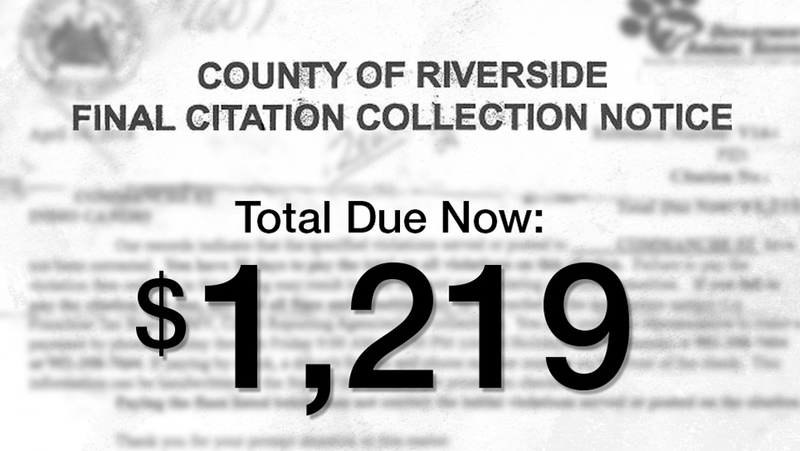 Riverside County told CNNMoney that this was part of its ongoing enforcement efforts across the county and residents could avoid paying the fines by fixing the violation within 30 days. While there are some low-cost options available for sterilization and other procedures, local advocates said waiting lists are often months long. They also railed against the agency for leaving wealthy, gated communities untouched. "They are threatening people. They are intimidating people," said Kim Maguire-Hardee, a local activist who runs a low-cost spay and neuter clinic. 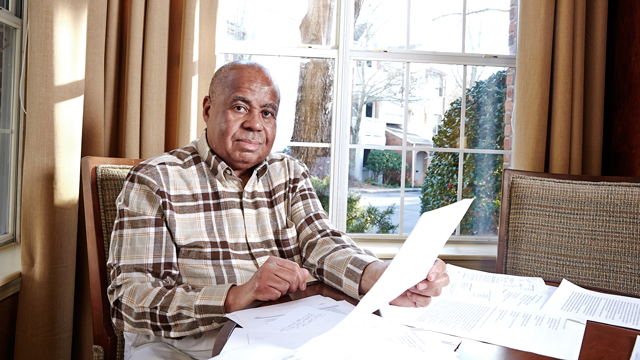 "[But] if people have lawyers and speak English, they don't go there." Drusys, who oversees the pet licensing program, says he takes "great exception to the accusation that we are picking on poor people." 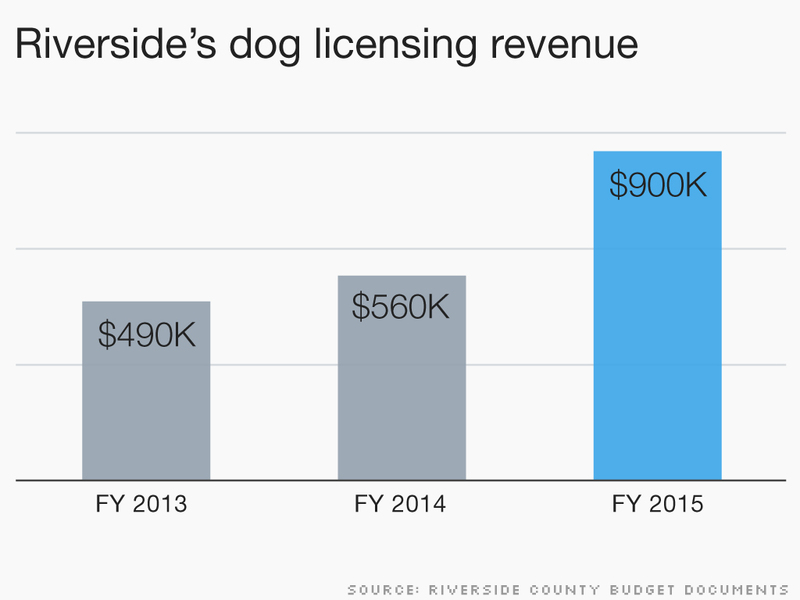 Licensing revenues are projected to almost double in Riverside County in two years. "It's not our fault that we don't go to the gated communities -- we go there all the time, they refuse entry," he said. Across Riverside County, many people are rushing to get their pets licensed. Licenses cost $16 a year for most dogs but jump to $100 for dogs that aren't spayed or neutered -- a procedure that can cost hundreds of dollars. Amid these aggressive enforcement efforts, Riverside projects that county licensing revenue will almost double from two years ago to nearly $1 million. But Drusys said the licensing program, which includes low-cost services like sterilization, is "not focused on revenue." "It is focused on getting dogs and cats spayed and neutered," he said. "Because if they're not born, they can't be impounded into the system." Elsewhere, owners are being charged to keep their animals alive until they are given a chance to argue their pet's innocence. McAdam's son Derrick sleeping with Jake at home before he was impounded. Colorado resident Caitlin McAdam's dogs, Jake and Lucy, were seized from her home two months ago after they were accused of killing a neighbor's cat. Even though no evidence was provided that linked her dogs to the incident, McAdam was told that they could be killed if she didn't pay $1,200 in upfront impound fees within 10 days. The Humane Society of the Pikes Peak Region, a contractor that handles animal control for the area, said fees are set by state law and the court determines how quickly a case gets heard. 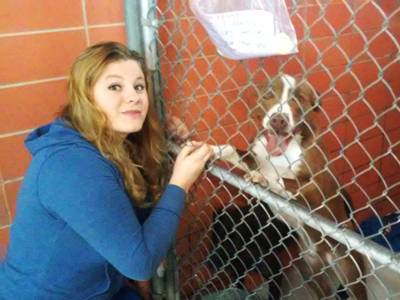 With the help of an attorney, McAdam moved her dogs to a private facility while they await trial. This costs her $250 a week. An initial hearing overseen by a judge was held in mid-February. And while her attorney recently learned that an autopsy of the cat found it unlikely that it was attacked by two dogs, McAdam is still awaiting a jury trial in April. At that point, she and her attorney plan to present proof of the dogs' innocence -- including multiple witnesses who were with the dogs when the alleged incident occurred. Until then, her family can only see their dogs during approved visits and will be spending thousands of dollars on storage fees and legal costs. To help cover these expenses, they've sold an old car, used a tax refund, borrowed money from friends and raised money through crowdfunding. 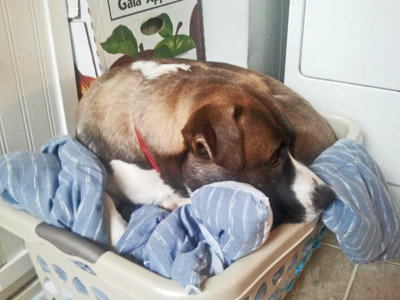 Derrick was heartbroken when his dogs were seized by animal control. But if the dogs are found guilty they could be killed anyway. If found innocent, McAdam will still be out thousands of dollars. "We've had to come up with extra (money) that frankly we just don't have," said McAdam, whose 9-year-old son Derrick has been traumatized by the incident. "It's hard -- it's definitely hard." Mary Root was arrested after her Chihuahuas got loose and she couldn’t afford to pay the fines. 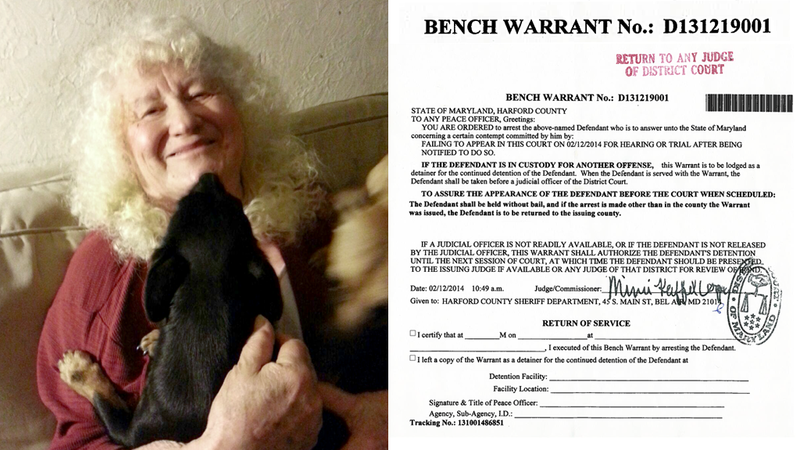 Mary Root, an 82-year-old widow from Havre de Grace, Maryland, spent two days in jail last March after her neighbor complained to animal control that her Chihuahuas had gotten loose three times. Root was charged $525 for the incidents. Living on roughly $2,000 a month and already struggling to pay her property taxes, she couldn't afford the fines. But she was thankful nothing happened to her dogs. When she missed a court hearing about the violations -- which Root said she couldn't attend for medical reasons -- an arrest warrant was issued and she was put in jail. 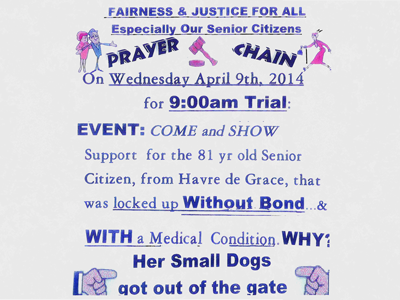 Locals rallied for support of Mary Root, who went to jail over unpaid pet fines. Root learned that she could either face more than a year in jail or owe $7,000 -- an amount that included the initial fines and new ones for missing the hearing. A Harford County spokesperson didn't respond to requests for comment. Root was only able to get out of jail after a good Samaritan heard her story on the local news and bailed her out. 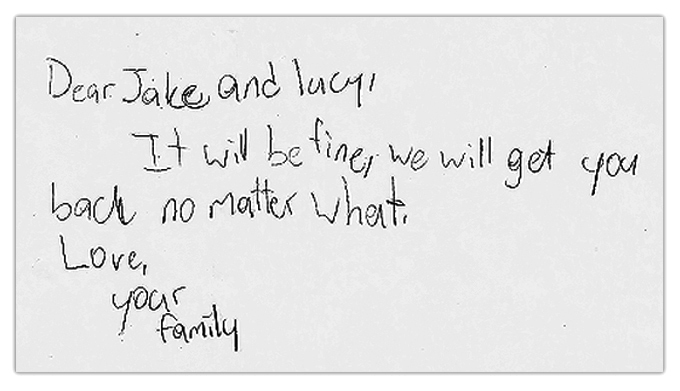 A pro bono attorney helped her negotiate the $7,000 bill to around $500, which she paid with the help of her church and lawyer. "It's been a nightmare," said Root, who lives alone. "I'm 82 and I'm just hanging in there -- that's why I value my little dogs." Readers: What do you think? 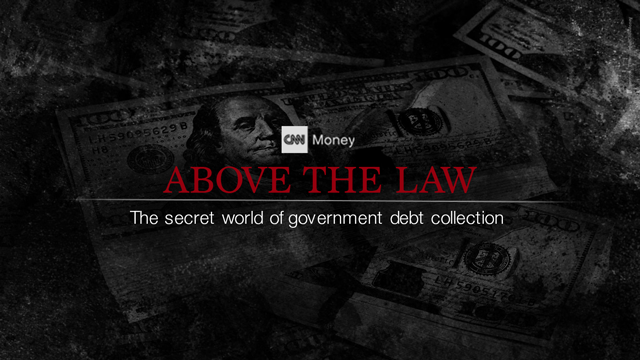 Have you had a small government violation turn into a big bill? Send us your reactions, experiences or other story ideas to investigate here.